It's a truly fabulous cast--I'm seeing it next Wednesday. Can't wait. In the September issue of Opera News Stephen J. Mudge reviewed Renée Fleming singing Arabella in Paris. He likes Renée's "creamy" sound, meaning her legato I suppose, but hates her German diction. He notes that the other singers have better diction and thinks they should be teaching their diction to her. These other singers, he notes, are lacking in creaminess. He points out that the audience went mad for Fleming, but he appears to have no idea why. Ok. You have to pick one. You get to have a "creamy" sound OR you get to have really good German diction. Renée has made her choice, and no amount of complaining is going to make her change her mind. People in Paris don't speak German so they won't care. You want Renée Fleming or you don't. If you know of someone who has both creaminess and diction, please tell me who. My recollection is that people also complained bitterly about Schwarzkopf's diction, though I don't recall having any trouble understanding her. There is a tendency today for German operas to be sung in a very talky way, as though all operas, including Strauss and Wagner, were buffa. I don't care for this all. 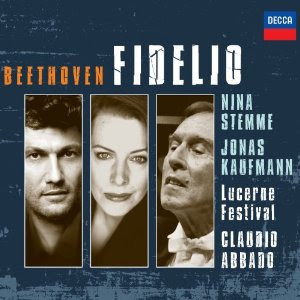 Gramophone has awarded the Opera Award to Fidelio and a Lifetime Achievement Award to it's conductor Claudio Abbado. If you're at all curious about my reaction to this recording, read here. Highest accolades to all. The Artist of the Year is also a singer: Joseph Calleja, though I don't notice that his album won. La Bartoli is for me by now an old love. I often ask myself if it were merely a coincidence that she turned out to be the most remarkable musician of her time. Surely it must be. I've never been known for prescience. She has an inordinate power over me and drags me around wherever she wants to go. Did I really want to be fascinated by Baroque Italians, I ask myself. I was pleased to read today that Sacrificium, one of my particular favorites, is in fact a public favorite as well. It spoke most directly to my heart. And now I find that I am not at all dragged into the music of Agostino Steffani, that he represents my old friends of the middle Baroque--the period of old favorites like Biber and Purcell. We are none of us to blame that we have never listened to him. My heart is already right at home here. The period has a straightforward innocence that cannot be found in Bach, Handel and Vivaldi for all their genius. Can it be that the artist only gets better? Once again she reinvents herself to suit the music. It will surely be remembered now that at a certain time in history music was Italian. This review has been coming and going because it's a little more personal than I might prefer. I've really enjoyed the rather excessive build up to this album release. My copy should arrive in a week or so. My sense of it is that it's very pleasing. Here is a description of the launch of Cecilia Bartoli's Mission concert series in Munich yesterday at Schloss Schleißheim . The interesting part comes at the end where the reviewer describes a kind of Baroque jam session between Bartoli and a trumpeter. That would be something to hear. The concert ended with a duet with Philippe Jaroussky. I've heard a bit of their duets together, and they are a joy. Apparently there were fireworks at this concert. I can't stop laughing. How do they get them to go off in rhythm with the music? Last night I attended the San Francisco Opera's Rigoletto with the second cast: Marco Vratogna as Rigoletto, Albina Shagimuratova as Gilda and Arturo Chacón-Cruz as The Duke of Mantua. Vritogna is the same guy who sang Iago in 2009. I thought his voice was a bit light for Verdi then, and I almost still do now. Looking at his performance history, professionals in the business don't seem to share this opinion. He sings a lot of Verdi. Rigoletto is considered early middle Verdi, almost bel canto, and can be sung lighter than Otello. Vritogna was the best of the cast, and when the role called for him to rise, he rose to meet it. His "Cortigiani" was conducted a bit fast by Maestro Luisotti, but was intense and lyrical nevertheless. As a human being, Rigoletto is a mess. He already hated his boss before the deflowering of his daughter, but deep down inside he is very warm and sweet. We saw this in this performance. Shagimuratova was Queen of the Night in the recent Flute. I liked her a lot more as Gilda. Perhaps a curvy softness fits her character better than the sharp corners of Queen. The tenor was ok, I guess. My friend liked him. I thought he sounded muffled. The chorus was terrific. I put in this picture of the staging so you can see the low stimulus nature of the sets and costumes. Roman arches. Occasional patches of color. That's it. The acting was also very low stimulus. Lots of standing around doing nothing. I've been watching Eurotrash a lot lately, and they keep everyone pretty busy and the sets quite messy. They are going for high stimulus, low cost. Something odd is going on at the San Francisco Opera. Until September 29 nothing is playing except Rigoletto. After that it gradually evolves back into the normal style for a repertory house, which is what the San Francisco Opera has always been. It is important to know there were a lot of empty seats. I love this. "The flowers I make unfortunately have no smell." You can watch the whole thing on YouTube. They live under an overpass and have a small Christmas tree. "Hast du Feuer?" The subtitles are in German, and this is the only pickup line I know in German. She looks like Priscilla Presley and he a bit like Dylan. It reminds of my long ago youth. I keep looking for someone to follow my three loves, but so far no one can hit the home run. Massimo Cavalletti who sings Marcello is pretty incredible. And adorable. It passes the crying test. The announcer at the end says "That was for the first time in the history of the Salzburger Festspiele Puccini's La Bohème. What is the matter with people? I am reading on YouTube--probably a mistake--a nonsensical discussion that has to do with two kinds of trills. Jeeze. Then, of course, they rant and rave against whoever is performing incorrectly this thing they have invented. The voice of any opera singer--maybe not Emma Kirby, but everybody else--fluctuates in pitch. It does this ALL THE TIME on every note. The brain consolidates this into a single pitch somewhere near the center of the fluctuation. Your brain may put these higher or lower than someone else's brain, giving you the idea that they are flat or sharp when they are in fact both flat and sharp at the same time. And they are both flat and sharp at the same time on every note they sing. This is called a vibrato, and it is the primary feature of opera singing. The brain does this consolidating until the fluctuation exceeds about a half step in extent, at which time the listener hears a trill. Your brain consolidates the fluctuation into a single pitch or it doesn't. There is no third possibility. To be most effective as a trill the fluctuation needs to be clearly wider than the normal vibrato. There seems to be something about the internet that encourages the arrogant ignorant. If the singer gets old, their vibrato may slow down. At this time it becomes a wobble. The trill effect is also distorted if the fluctuation is too slow. The rich and famous are chosen in part because their vibratos are pretty. A vibrato can just as easily be ugly. It is also possible that the precise same vibrato will seem pretty to some and ugly to others. Your opinion of any given singer's vibrato (and by extension trill) did not drop from heaven. It's just your opinion. While I was in Santa Fe, our instructor Oliver Prezant proposed that opera is about the conflict between love and duty. This came up in discussions about Maometto II where both Maometto and Anna are torn between their love for each other and their duty to their two countries. In our version duty wins. In the version with the happy ending love wins. So is this true? How many operas show this plot? Of our five in Santa Fe clearly this is the plot of Tosca. The title character is not the conflicted character. 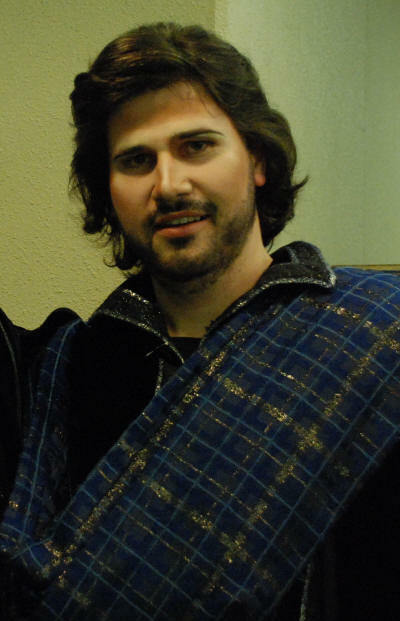 Here it is Cavaradossi who is torn between his love for Tosca and his duty to his fellow political partisans. In Tosca everyone loses. In The Pearl Fishers the conflicted character is Zurga, the newly elected king of the pearl fishers, who is torn between his duty to his friend and his unrequited love for Leila. He comes to his senses in time. Arabella is about jealousy. It's one of those unfortunate coincidence plots. King Roger is about .... There is no love plot. I think. La Traviata is a love vs duty plot. Alfredo has a duty to his family which he ignores in favor of his love for Violetta. Since the father cannot persuade his son to return to the family, he instead persuades his son's lover to turn Alfredo back to his duty. She knows the only thing that will work is to degrade herself in his eyes. Cosi fan Tutte is about the girls' duty to their present fiancés versus their love for the new young men. Mozart/Da Ponte say that they will always choose love. Carmen, everyone knows, is about the conflict between Don Jose's love for the utterly fascinating Carmen and his duty to his mother and Micaëla. The right Carmen can make us forgive him. 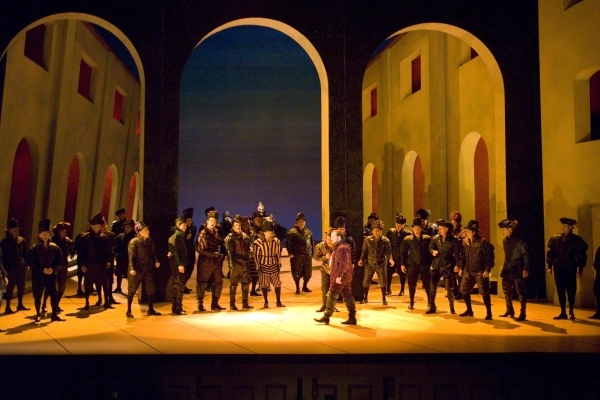 There are at least two conflicts in Rigoletto. Gilda experiences conflict between her duty to her father and her love for the Duke. But it is the second conflict that brings tragedy. Rigoletto fails in his duty to protect his daughter and gives in to his passion for revenge. 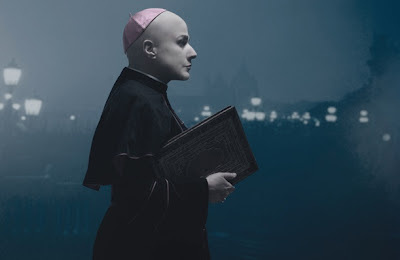 It is a unique and wonderful opera. Nothing is more clearly one of our plots than Aida. Radamès betrays his country for the sake of his love for Aida. Everything else is subplot. Werther is another opera in our category. This time it is Charlotte who is conflicted between her duty to her promise to her mother and her love for Werther. I like it. It isn't the only plot, but it covers a lot of operas.